The temperature is sinking today as Arctic air engulfs our part of the country. Everyone seems a little down with the season, the endless grey and salt stained boots, hunched against the wind. 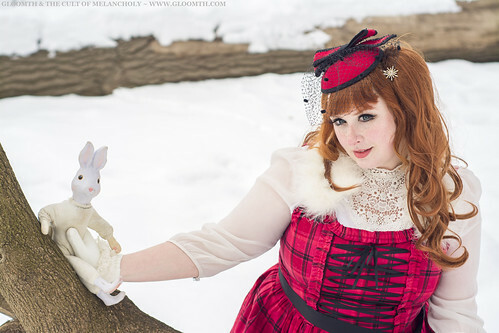 Today we’re highlighting 3 of our favorite winter themed photoshoots to remind ourselves that the season isn’t entirely all bad! It’s the perfect time of year to get cozy at home! This shoot with Gloomth Girl Poppy is the embodiment of a quiet Sunday in January. She’s wearing our “Odette” dress in black and cream. The contrast of fresh snow against the world is one of the most beautiful sights I think! This bright shoot by Tyrone Islington Photography features a red variation of our “Valance” dress modeled by Gloomth’s designer Taeden Hall. If you’d like a custom fabric variation of any of our designs please email us, we’re happy to arrange a one of a kind style just for you! Winter is also a season of stories, this time of year shows up again and again in folk tales and mythology. This dreamy shoot with model Grayling is an unnamed fairy tale set in a snowy landscape.